Researchers from MIPT's Laboratory of 2D Materials' Optoelectronics, Institute of Radioengineering and Electronics, and Tohoku University (Japan) have theoretically demonstrated the possibility of creating compact sources of coherent plasmons, which are the basic building blocks for future optoelectronic circuits. The way in which the device would operate is based on the unique properties of van der Waals heterostructures — composites of graphene and related layered materials. A paper detailing the study has been published in the Physical Review B journal. The plasmon is a quasi-particle that is a "mixture" of oscillating electrons and the electromagnetic field coupled with them. Plasmons can be used to generate, transmit, and receive signals in integrated circuits. Plasmons can act as mediators between electrons and light waves in highly efficient photodetectors and sources, particularly in the actively explored terahertz range. It is interesting to note that plasmon energy can be stored at a length scale much smaller than the wavelength of light. This means that plasmonic devices can be far more compact than their photonic counterparts. The most "compressed" plasmons are those that are bound to the conducting planes, and these plasmons can be used to make the most compact optoelectronic devices. But where can one find a conducting plane that supports ultra-confined plasmons? For more than forty years, such objects have been created by sequential growth on nanometer-thin semiconductors with affine crystal structures. In this process, certain layers are enriched with electrons and obtain good electrical conductivity. These "layer-cakes" are called heterostructures — Russian physicist Zhores Alferov was awarded the 2000 Nobel Prize in Physics for their development. However, growing nanoscale layers is not the only way of obtaining flat semiconductors. During the last decade, researchers' attention has been focused on a different, intrinsically two-dimensional material — graphene. Graphene is a one-atom-thick layer of carbon, and it can be obtained by simply slicing a graphite crystal. The study of the unique electronic properties of graphene (which are radically different from those of classical heterostructures) was marked by another Nobel prize awarded to the MIPT alumni Andre Geim and Konstantin Novoselov (2010). A great number of graphene-based devices have already been created, including transistors receiving high-frequency signals, ultrafast photodetectors and even the first prototypes of lasers. The properties of graphene can be further enhanced by placing it on another material with a similar crystal structure. Materials similar to graphene can essentially be used to create the "layer-cake" heterostructures mentioned above. In this case, however, the building blocks of the structures are joined by van der Waals forces, which is why they are called van der Waals heterostructures. In their work, the researchers show that a heterostructure comprising two graphene layers separated by a thin layer of tungsten disulphide not only supports the compact two-dimensional plasmons, but can also generate them upon the application of interlayer voltage. "The structure we are modeling is essentially the gain medium for plasmons," explains Dmitry Svintsov, the first author of the research. "More common examples of gain media are the neon-helium mixture in a gas laser, or a semiconductor diode in a laser pointer. When passing through such a medium, the light is amplified, and if the medium is placed between two mirrors, the medium will generate the light by itself. The combination 'gain medium plus mirrors' is at the heart of any laser, while the gain medium for plasmons is a necessary element of a plasmonic laser, or spaser. If the gain medium is switched on and off, the plasmonic pulses can be obtained on demand, which could be used for signal transmission in integrated circuits. The plasmons generated in the gain medium can also be uncoupled from the graphene layers and propagate as photons in free space. This allows one to create tunable sources of terahertz and far infrared radiation." > Band diagram of the graphene — tungsten disulphide — graphene structure explaining the principle of plasmon generation. The application of interlayer voltage V results in the enrichment of one layer by electrons (blue), and the emergence of free states (called holes) in the opposite layer (red). An electron can tunnel from an occupied state to an empty state (dashed line), and its excess energy can be spent to excite a plasmon (red wavy line). Apparently, the gain medium is not a perpetuum mobile, and the particles created by it — either photons or plasmons–must get their energy from a certain source. In neon-helium lasers, this energy is taken from an electron thrown onto a high atomic orbital by the electric discharge. In semiconductor lasers, the photon takes its energy from collapsing positive and negative charge carriers — electrons and holes, which are supplied by the current source. 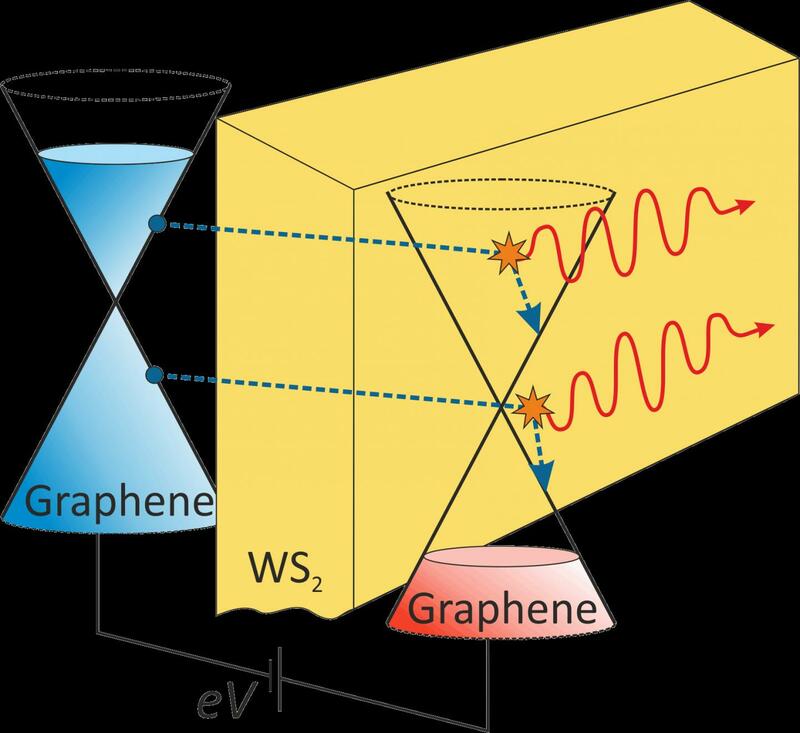 In the proposed double graphene layer structure, the plasmon takes its energy from an electron hopping from a layer with high potential energy to a layer with low potential energy, as shown in the figure. The creation of a plasmon as a result of this jump is similar to the way in which waves form as a diver enters the water. To be more precise, the electron transition from one layer to another is more like soaking through the barrier rather than jumping over it. This phenomenon is called tunneling, and typically the probability of tunneling is very low already for nanometer-thin barriers. One exception is the case of resonant tunneling, when each electron from one layer has a "well-prepared" place in the opposite layer. "The principle of plasmon generation studied by our group is similar to the principle of the quantum cascade laser proposed by the Russian scientists Kazarinov and Suris and realized in the USA (Faist and Capasso) more than twenty years afterwards. In this laser, the photons take energy from electrons tunneling between gallium arsenide layers through the AlGaAs barriers. Our calculations show that in this principal scheme, one can profitably replace gallium arsenide with graphene, while tungsten disulphide can act as a barrier material. This structure is able to generate not only photons, but also their compressed counterparts–plasmons. The generation and amplification of plasmons was previously thought to be a very challenging problem, but the structure we have proposed brings us one step closer to the solution," says Dmitry Svintsov. The paper written by Dmitry Svintsov, Zhanna Devizorova, Victor Ryzhii, and Taiichi Otsuji received the Alferov's Foundation Young Scientist Award at the 24th International Symposium "Nanostructures: Physics and Technology", which was held in Saint Petersburg in July 2016.